The similarities between spruce and fir trees number about the same as their differences. Both are members of the pine family, are evergreen, and are classified as conifers, which means the trees have needles that grow singly from the twig (rather than leaves) and cones as fruit. The differences include the way the needles and cones grow and where the trees are located. The needles of the spruce grow from the ends of short pegs on which they are mounted, according to the “National Geographic Field Guide to the Trees of North America,” by Keith Rushforth and Charles Hollis. After the needles fall off, spruce branches remain rough to the touch. The needles on fir trees are attached directly to the twigs and when the needles fall, the twigs are smooth. 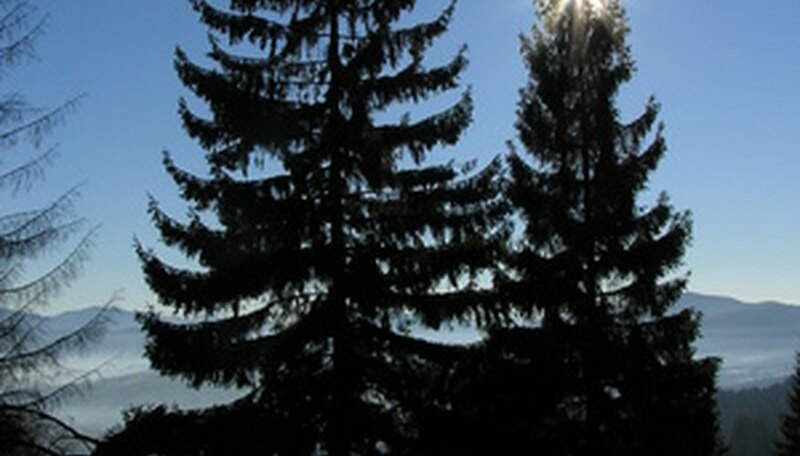 The cones on both spruce and fir trees are found mainly near the top of tree, according to “Field Guide to Trees of North America” by the National Wildlife Federation. The difference is that the cones of the spruce tree hang downward and the cones of the fir trees stand straight up, leaking resin. Furthermore, fir tree cones drop their scales at maturity, literally disintegrating until only the core is left on the branch. Most spruce tree cones mature within a year, and fall off the tree intact. One other key difference between spruce and fir trees is location. Spruces are hardy evergreen conifers found in the colder reaches of the Northern Hemisphere, according to “The Illustrated Encyclopedia of Trees of the World,” by Tony Russell, Catherine Cutler and Martin Walters. Firs, on the other hand, are distributed across the continent, from Canada to Central America. One species, Frasier's fir, is found primarily in the southeastern United States.